Digital Surveillance Location Analysis helps detect some of the most difficult bugs used in all areas of illegal surveillance, from marital cases to major economic industrial espionage cases. Many devices today use GSM (Global System for Mobile communications) which is a digital cellular technology used for transmitting mobile voice and data. Bugs built on top of GSM technology are essentially stripped down mini cell-phones that are easily remotely-controlled by an eavesdropper. They only transmit brief radio signals when on standby resulting in long periods of radio silence – making these devious devices extremely difficult to detect and find. Rogue Wi-Fi Access Points (APs) pose similar detection challenges. These electronic surveillance techniques leverage the power of the Internet and cellular telephone system to instantly send eavesdropped voice, data and video worldwide. You might think these devices are expensive and difficult to purchase. Click here for an instant education. 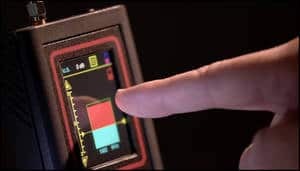 Locating these types of devices is nearly impossible without the proper instrumentation. Murray Associates had a custom solution developed to assist with discovering these digital bugging devices. Digital Surveillance Location Analysis ™, was designed explicitly to ferret out GSM cellular bugs, and devices which use rogue Wi-Fi. Although our Digital Surveillance Location Analysis ™ instrumentation can detect and locate GSM bugs in buildings, it is particularly efficient locating GSM bugs in trucks, aircraft and automobiles. DSLA captures the signals emitting from the surveillance device, no matter how briefly. 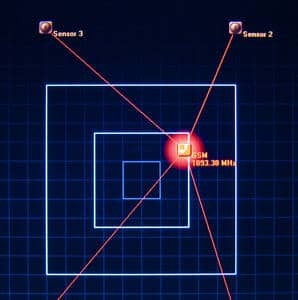 Using signal triangulation techniques it displays the relative location of the device to within a few feet! If you have any questions about Digital Surveillance Location Analysis or the TSCM services provided by Murray Associates, simply fill out the form below, or call us from a safe area and phone.